Hofmann’s unbalance measuring systems are the machine’s operator interface. They capture and precisely evaluate the signals of the measuring device, as well as calculate and control the unbalance correction. They are used both with manual balancing machines, as well as with fully automated balancing systems. Hofmann’s unbalance measuring systems consist of tailor-made measuring hardware and software, which is installed on a high quality industrial PC. They are used with a variety of balancing machines and can be applied to replace or retrofit both older Hofmann systems and third party products. Hofmann’s measuring hardware records the signals from the measuring sensors and speed sensor, which are built into the balancing machine. It then precisely filters out the components required for unbalance calculation. 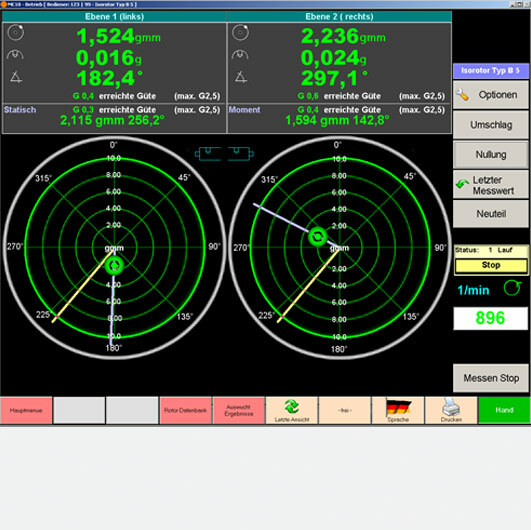 The PC measuring software is used to control settings for a particular balancing application. It also supports and controls the unbalance measurement and correction with clear display presentation. Reliable and intuitive calibration instructions ensure that our balancing machines always measure and display data correctly, whether they are hard-bearing, soft-bearing, single-plane or dual-plane. A special calibration function is also available to address the behavior of flexible rotors. Balancing data can be recorded, saved to a database and evaluated applying statistical methods. A backup function makes sure that an unbalance measuring system can be restored to a given condition. Available interfaces allow for communication and data exchange with controls, peripheral devices or a data server.